BAL-AMi was the biggest British manufacturer and distributor of jukeboxes in the golden rock 'n' roll era of the mid 1950's through to the early 1960's. This web site has been built over a period of 21 years with the help of a number of people (older than me ...) who were around at the time. 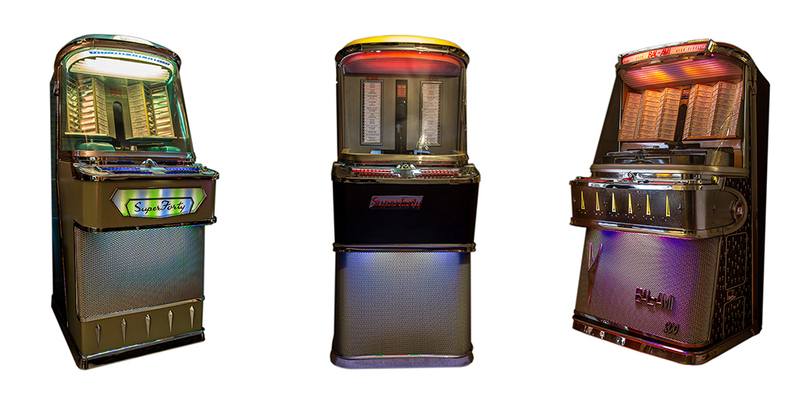 We've established a broad history of the company, uncovering many fascinating details, including the recollections of many who worked in the factories producing the jukeboxes. I'm always looking for more information - send it to me, and I'll publish the info on this site. I'm interested in hearing from anyone with BAL-AMi stories to tell, and BAL-AMi pictures are welcome. In particular, I am trying to track down any photos that may exist of a van that Balfour decked out in BAL-AMi logos - there is a project on-going to recreate one of these ! Feel free to contact me if you can help with any of the above. For my own part, I'm just a BAL-AMi owner, and am definitely not an expert on how they work and fault-finding - so it's probably not worth asking. The best way to get sound technical advice on BAL-AMi jukeboxes is to join the British Jukebox Owners' forum (otherwise known as BJO). It's free, and they're quite a friendly bunch with years of experience. There are also a couple of excellent groups on Facebook - "Classic Jukeboxes" and "The Original Classic Jukebox". In the meantime, take a tour of the site to learn more about this once-famous jukebox manufacturer. This web site was originally published in November, 1997, and is brought to you from Enfield, UK. Last updated in March, 2019. Copyright notice: All of the content on this web site is subject to copyright ownership. Some by myself, but most of the content has been kindly donated by fellow jukebox enthusiasts who have given me permission to publish their articles and photos. If you wish to reproduce anything from this web site, it is a simple courtesy to ask me first - I usually have no problem with this. Sometimes I have to also check back with the originator - and they usually say yes as well !